you want and clicking on the Add To Cart button after each selection. My Gourmet DipKits Cost $3.50 each. SHIPPING IS FREE in the Lower 48 States! Please email me for postage charges for outside the lower 48 states and/or for larger quantities. or call me at 715-742-3953 and I will help you. and the Cream of The Crop Cucumber. Special Instructions FOR THE BUYER! I will give you one Gourmet DipKit of your choice FREE! with your flavor request, I will include a flavor of my choice. you get 1 FREE Gourmet DipKits Cook Book! 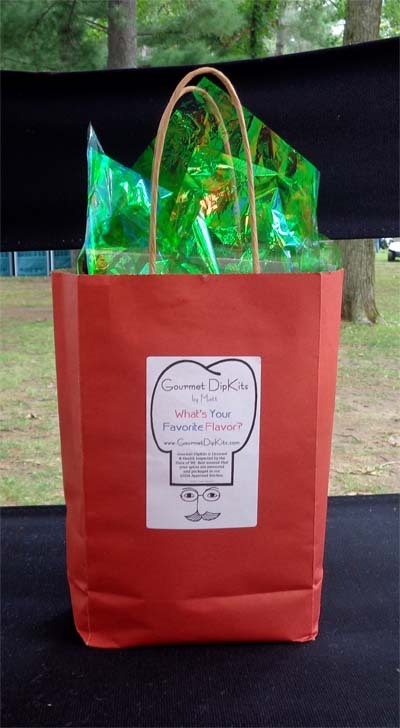 I am happy to announce my NEW Gourmet DipKits Gift Bag Special! one of each flavor (no substitutions), for just $47! which has 90 of our own recipes to use with Gourmet DipKits Spices! assembled gift bag when finished. (with 90 of my own recipes). before she makes it up. Please allow 1 to 4 weeks for delivery! Thank you for your order and enjoy! ©2019 Gourmet DipKits. All Rights Reserved. Unauthorized reproduction or use of any images, information, or trademarks contained on this site is prohibited. Prices & product specifications are subject to change without notice.